With a talented upholsterer on your side you can completely reinvent a piece of furniture to better reflect the style of your home. Your small sofa with beautiful decorative arms and legs can be reborn as a longer, more roomy and relaxed piece, with the same features you love. A wobbly chair can certainly be saved, and worn out springs or foam are easily replaced. Adding or removing a skirt can make a huge difference to a chair or sofa, particularly if you have one with great legs that you want to show off. A big, bulky, padded back rest can be reduced to a sleek and smooth modern look, and thin or unappealing arms can be padded out to add comfort and visual appeal. It’s possible to completely change the look and functionality of a piece of furniture, while maintaining the original quality frame and springs as well as the great visual features. Reupholstering furniture is an environmentally friendly alternative to buying new. Older pieces are often built to last, and by reupholstering them a few times throughout their life you can avoid contributing to the vast amount of modern furniture which ends up as land fill. Older pieces are often made of more natural materials, without the use of so many chemicals. To tell if a piece of furniture is good quality, check for coil springs or heavy-gauge sinuous springs, as opposed to lightweight springs, and legs which are built into the frame of the piece, rather than ones which screw on. Better furniture uses high density foam which lasts much longer, and often has dowelled joints- not stapled! These are all signs that the piece of furniture is built to last, and can be made even more comfortable, durable, and personalised with a little bit of TLC. Upholstering furniture gives you a great creative freedom which you won’t find in stores. Whether you need to work with the unique angles and dimensions of your home, or create a sofa which perfectly complements your walls and curtains, a furniture upholsterer can help. 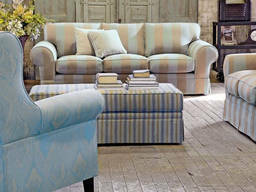 Consider choosing a colour from your curtains to feature in your sofa. This will tie the interior space together. Reupholstering old family pieces is a great way to bring a sense of tradition and family to a room, as well as maintaining a modern style. Or perhaps you want to create a custom piece of furniture from scratch, so that you can have exactly the look you want. Stay on trend with exciting new prints, or play it safe with neutral tones. Don’t forget the power of different textures to harmonise with the rest of the room. If you have a favourite colour, featuring it in different shades can add depth and visual interest to a room without looking over the top. Two-tone sofas and chairs are engaging, but subtle. If a print is what really grabs your eye, consider featuring it on only the seat of the chair, with a complementary block colour on the arms and back. Or go all out and select two bold prints for a brave statement piece! For more information, please contact the expert contributor.